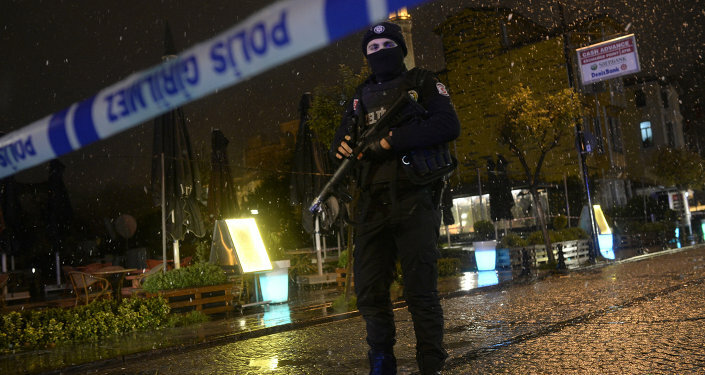 One police officer died of his injuries, another police officer was seriously wounded after a female suicide bomber blew herself up at the police station in Istanbul’s historic district Sultanahmet. MOSCOW, January 6 (Sputnik) — One police officer has died and another has been injured in a Tuesday female suicide bomber’s attack at a police station in Istanbul, Turkish Today’s Zaman reported citing the city’s governor Vasip Sahin. Sahin said that the critically wounded officer Kenan Kumas succumbed to his wounds and died in the local hospital. The governor added that the authorities are currently trying to identify the attacker. Sahin told journalists earlier that an unidentified English-speaking woman entered a tourism police cabin in Istanbul’s historic Sultanahmet district claiming to have lost her wallet or passport and blew herself up wounding two officers. The attack occurred shortly after 05:00 p.m. local time (15:00 GMT). On January 1, Turkish police arrested an armed man who threw a hand grenade at a police post in front of the Dolmabahce Palace in Istanbul which serves as an office of the country's prime minister Ahmet Davutoglu. The bomb did not explode. Turkish far-left Revolutionary People’s Liberation Party Front claimed responsibility for that attack.